And a Ho-Ho-Ho! 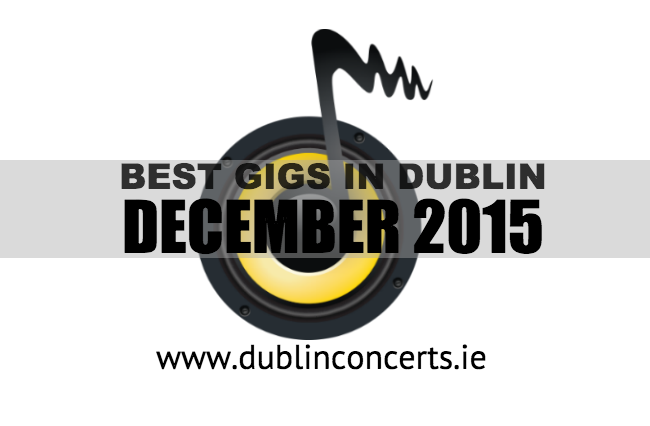 Hello and welcome to the December edition of the Dublin Concerts gig recommendations, where we rifle through some of the best gigs the city has to offer this festive season. First up, in the 3Arena on the 2nd and the 3rd we have English folk rockers Mumford & Sons. Earlier this year, the band released their latest album Wilder Mind, which was an instant success worldwide, taking the top spot in Ireland, the UK and the US Billboard charts. At Whelan’s, beginning on Saturday the 5th for a two night stint, is Irish singer-songwriter Declan O’Rourke. Also on Saturday the 5th is another Irish music legend, Jerry Fish, who will be accompanied by his Electric Sideshow at Vicar Street. Sunday the 6th is all about classic rock. Slade play the Vicar Street venue, whilst at the other end of the quays at the 3Arena are two English Rock legends Whitesnake and Def Leppard. I’m sure everyone is in no doubt that Slade will break out their Christmas number one single of old ‘Merry Xmas Everybody’ with the month that’s in it. At the Workman’s Club on Wednesday the 9th is a former Dublin Concerts Irish Band Of The Week, I Have a Tribe (also known as Patrick O’Laoghaire). He’s set to release his latest EP, his first since his last outing Yellow Raincoats, which was released in May 2014. Thursday the 10th sees the return of Manchester outfit Happy Mondays to Irish shores. Having previously played the Bulmers Live Festival at Leopardstown, this time we’re back indoors at Vicar Street for a special intimate gig. Rising up through the charts over the past couple of years and now cementing his place with sold out shows in Europe and America, Gavin James returns home for a wonderful show at Whelan’s on Monday the 14th as a warm up to his Christmas residency at the venue from Monday the 21st to Wednesday the 23rd. Northern Ireland Rockers Ash, return to Dublin on Tuesday the 15th to play historic Dublin venue The Olympia Theatre. Still touring after the release of their sixth studio album Kablammo! earlier this year, the date is one of many on their festive season tour. On Thursday the 17th at The Workman’s Club is two of the hardest workers in the Dublin music scene Morrissey and Marshall and on Friday the 18th and Saturday the 19th is everyone’s favourite Dubliner Damien Dempsey who plays Vicar Street. Sunday the 20th sees Academy award winner (how often can you say that!) Glen Hansard play a sold out show in Vicar Street once more as part of a two night stint at the venue. Now into Christmas week it all begins to heat up with the biggest Irish Act of 2015, Hozier, who plays the 3Arena on Wednesday the 23rd. The ‘Take me to Church’ singer has had massive success worldwide over the past twelve months including wins at the Billboard awards and Teen Choice awards on the other side of the Atlantic. Hozier will be joined by Gavin James, Hudson Taylor, Little Green Cars, Ryan Sheridan and The Riptide Movement. On the same night Wicklow songstress Luan Parle plays the Grand Social on Dublin’s north side. The Meteor award winner is back on the scene this year after superb single and video for ‘Roll the Dice’ was released earlier in 2015. Support on the night comes from Clive Barnes. Sunday the 27th will leave you with a tough choice, with two stellar acts performing on the same night. With Paddy Casey playing in Whelan’s and Aslan playing Vicar Street, it’s definitely not a choice we would like to make. Tom Dunne and the rest of the gang in Something Happens play Whelan’s on Tuesday the 29th followed by former Voice of Ireland judge Brian Kennedy on Wednesday 30th at the same venue. To close out the year and to dance away some of that turkey, the Three Countdown Concert gets underway on New Year’s Eve featuring some great artists, including Fatboy Slim, Ryan Sheridan, Little Hours and the headliners The Coronas. So there we have it, the last monthly gig recommendation article of the year. Have a great Christmas and a very musical New Year. Let us know what gigs you are looking forward to this month.